We are looking for 100 Spread The Happiness families to take the Summer 2017 Happiness Award - Could it be your family? ...Complete 30 of the 50 "Things to do this Summer" to get a certificate to say your family is a Happy Family! 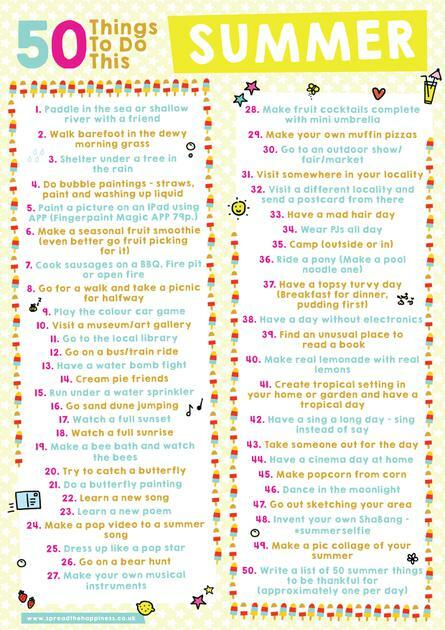 ...Complete ALL 50 things then you will win an exclusive Spread The Happiness Bag. How do i get a list of the 50 things to do? We have included it here for you on this posting! Email: info@spreadthehappiness.co.uk or click the button below. You will then receive a Facebook group link to join our private group in which your family can share evidence or blog about your challenges. You will also receive our Twitter details so you can tweet your evidence to us - it's your choice how you want to share. Come on ... you know you want to!